It’s been moderately busy in Midgard, with the first — draft-level, not final! — Dragon Age RPG content delivered as part of my Prince of Midgard interview with the Oracle: the Triolan Corsair background. The Stargazer’s World interview expands on that with a short history and discussion of the future plans for the setting. 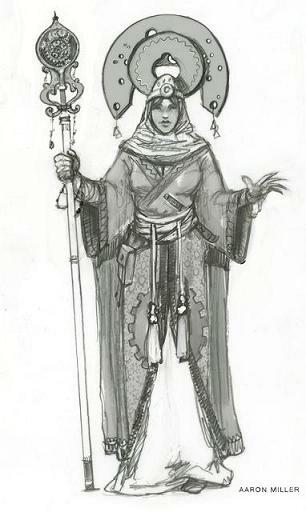 Throw in this terrific sketch of a priestess of Rava by Aaron Miller and the recent Declaration of Principles, and I’d say not a bad week. The real news, of course, is that the project is closing in on funding goal! We’re looking at a launch into the first design stage in early February, or possibly sooner if a handful more patrons join us. 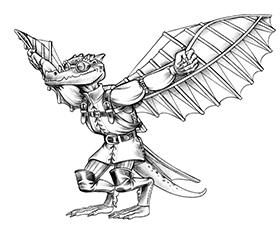 As noted in week 1 report, the Pathfinder RPG and the Dragon AGE System seem to be the mechanics of choice. Not sure where the 4th Edition support has gone, but perhaps the fact that 4th Edition Dungeons & Dragons has 3 official campaign settings at last count—where Pathfinder and Dragon Age have one each—may have something to do with the varying levels of support…. Creatively, my big accomplishment was eating sushi with Jeff Grubb, which proved to be so inspiring I went back to my desk and wrote the entire outline for the setting. The outline was at 200+ pages before I realized that was completely insane and cut it back to 192. Now I’m tweaking it and second-guessing myself, and will share that outline with patrons as soon as when it’s ready, likely in the next week. If you are not a patron yet, what would you like to know about this setting? If you are a patron, what region or element would you like to tackle first? My current interest lies heavily with The Tsars and Steppes. That’s something I could sink my teeth into. Would you consider putting a Tag for Dragon Age so patrons interested in them may find those articles easier? This is going to be awesome! Midgard has everything that I’m looking for in a setting. It will be a blast having a hand it’s evolution! It was awesome having you on the Dragon Age Oracle, and even more so getting that sample of what Midgard would look with the AGE System. Thanks for that. Did you say 192 pages for the outline? Yes, I would consider a Dragon Age tag! Done, Scott and Daniel. I’ve not played Dragon Age RPG, but I have no end of good things about it. It was exactly that ratio of campaign settings to system that prompted me to offer my secondary vote to DA and it’s fans. I sincerely hope it helps to further promote it. There’s no limit on the number of quality systems we can have, supported by quality settings. I am very interested in the Seven Cities. You know what would be a great way to whip up more support for the new campaign setting? An Open Design Podcast. Have I mentioned that already? Only 192?!? You can do better than that! Bring it BABY! Oddly, the podcast has inspired something else, but I’ll discuss that later in February. And yeah, the line at 160 failed, and I have my doubts about 192. But for my sanity right now, that’s the first hurdle. I expect we’ll exceed it. Seven Cities all the way, please. A little intrigue never hurt anyone! Well, I would have been in, as would have other 4E patrons, had we known it would be a go for 4E. Not everyone that has not done this before understands what the cancellation policy is or is not on picking a setting, for example. Too bad, I really was interested in this before. Now, not as much. How rules heavy is it? I agree, there’s never a guarantee of a particular rules set, but I should have been much clearer in saying that the same refund policy is in place for this project. For rules, it’s lighter than adventures or splatbooks. Based on the current outline, about 15% rules material, 85% setting, hooks, and culture. More like the Planescape box, setting up mysteries, areas to explore, things for players to do. 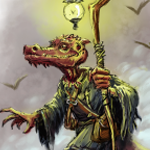 Also, see this Forum post about Midgard 4E.